Harnessing wind energy to perform work is not a new concept. Since the earliest of times, wind power has been captured with sails to allow traders, merchants and explorers to ply their trades and discover the world around them. On land, windmills have been used for irrigation, grinding grains, and performing crude manufacturing for centuries. Even the generation of electricity from wind power is not a new idea. What is new, however, is the scale at which this renewable energy source is being used today. Early wind generation served a local need, often supplying power for isolated equipment. Today, wind energy represents nearly 5% of the US electrical generation and is targeted to reach 20% in the foreseeable future. For this to happen, wind turbine outputs need to be gathered, stepped-up to transmission levels and passed across the nation’s interconnected power grid to the end users. The role of the Wind Turbine Step-Up (WTSU) transformer in this process is critical and, as such, its design needs to be carefully and thoughtfully analyzed and reevaluated in our view. Historically this WTSU transformer function has been handled by conventional, “off the shelf” distribution transformers, but the relatively large numbers of recent failures would strongly suggest that WTSU transformer designs need to be made substantially more robust. WTSU transformers are neither conventional “off the shelf” distribution transformers nor are they conventional “off the shelf” power generator step-up transformers. WTSU transformers fall somewhere in between and as such, we believe, require a unique design standard. Although off-shore wind farms using dry-type transformers are beginning to grow in popularity, for this discussion we will look only at liquid-filled transformers that are normally associated with inland wind farm sites. Wind turbine output voltages typically range from 480 volts to 690 volts. This turbine output is then delivered to the WTSU transformers and transformed to a collector voltage of 13,800 to 46,000 volts. The turbines are highly dependant upon local climatic conditions; and this dependency can result in yearly average load factor as low as 35%. Both conventional distribution transformers and power generator step-up transformers are typically subjected to more constant loading at, or slightly above, their theoretical maximum rating. This high level of loading stresses insulation thermally and leads to reduced insulation life. On the other hand, the relatively light loading of WTSU transformer has a favorable effect on insulation life but introduces two unique and functionally significant problems with which other types of conventional transformers do not have to deal. The first problem is that, when lightly loaded or idle, the core losses become a more significant economic factor while the coil or winding losses become less significant and de-emphasized. Typically used price evaluation formulae do not apply to this scenario. NEMA TP1 and DOE efficiencies are not modeled for the operational scenario where average loading is near 30-35% and, consequently, should be cautiously applied when calculating the total cost of ownership for WTSU transformers. The second problem is that the WTSU transformer goes into thermal cycling as a function of these varying loads. This causes repeated thermal stress on the winding, clamping structure, seals and gaskets. Repeated thermal cycling causes nitrogen gas to be absorbed into the hot oil and then released as the oil cools, forming bubbles within the oil which can migrate into the insulation and windings to create hot spots and partial discharges which can damage insulation. The thermal cycling can also cause accelerated aging of internal and external electrical connections. These cumulative effects put the WTSU transformer at a higher risk of insulation and dielectric failure than either the typical “off the shelf” distribution transformer or the power generator step-up transformer experiences. Another unique aspect of WTSU transformers is the fact that they are switched in the line with solid state controls to limit the inrush currents. This differs widely from the typical step-up transformer which must be designed to withstand high magnetizing inrush currents which cause core saturation, and in the extreme Ferroresonance. While potentially aiding in the initial energization, these same electronic controls contribute damaging harmonic voltage frequencies that, when coupled with the non- sinusoidal wave forms from the wind turbines, cannot be ignored from a heating point of view. Conventional distribution transformers do not typically see non-linear loads that require preventative steps due to harmonic loading. When a rectifier/chopper system is used, the WTSU transformer must be designed for harmonics similar to rectifier transformers, taking the additional loading into consideration as well as providing electrostatic shields to prevent the transfer of harmonic frequencies between the primary and secondary windings, quite dissimilar to conventional distribution transformers. WTSU transformers are designed such that the voltage is matched to the generator (e.g. wind turbine) output voltage exactly. There is no “designed in” over-voltage capacity to overcome voltage fluctuations, as is typically done on distribution and power transformer designs which allow for up to 10% over-voltage. Further, it should be noted that the generator output current is monitored at millisecond intervals and the generator limited to allow up to 5% over-current for 10 seconds before it is taken off the system. Therefore, the WTSU transformer size ( kVA or MVA) is designed to match the generator output with no overload sizing. Since overload sizing is a common protective practice with “off the shelf” distribution or power step-up generator transformers, the WTSU transformer design must be uniquely robust to function without it. Typically, conventional distribution transformers, power transformers, and other types of step-up transformers will “drop out” when subjected to an under-voltage or over- current situation caused by a fault. Once the fault has cleared, the distribution transformer is brought back on-line either individually or with it’s local feeder in conjunction with automatic reclosures. Wind turbine generators, on the other hand, in order to maintain network stability are only allowed to disconnect from the system due to network disturbances within certain, carefully controlled network guidelines developed for generating plants. Depending upon the specific network regulations, the length of time the generator is required to stay on line can vary. During this time the generator will continue to deliver an abnormally low voltage to the WTSU transformer. Therefore, during near-to generator faults, the generator may be required to carry as low as 15% rated voltage for a few cycles and then ramp back up to full volts a few seconds after fault clearing. This means that the WTSU transformer must be uniquely designed with enough “ruggedness” to withstand full short circuit current during the initial few cycles when the maximum mechanical forces are exerted upon the WTSU transformer windings. 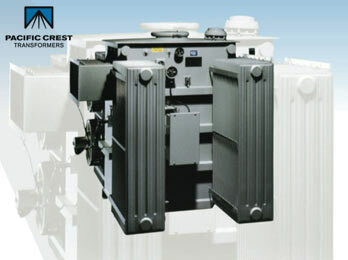 Since wind turbines must stay connected during disturbances in the network, the WTSU transformers must be designed to withstand the full mechanical effects of short circuits. The role of WTSU transformers in today’s wind generation scheme is unique; it’s design must be equally unique and robust. The combination of wide variations in loading; harmonic loads from associated control electronics and generators; sizing without protection for over-voltages, under-voltages or over-loading; and the requirement to “ride through” transient events and faults sets the WTSU apart from it’s more conventional, “off the shelf” counterparts. It is neither a conventional distribution transformer nor is it a conventional generator step-up transformer. “Off the shelf” . . . doesn’t belong . . . “down on the farm”!